Liverpool's Raheem Sterling has been named as the club's Young Player of the Year, but was booed by a small number of fans as he collected his award. The 20-year-old forward received the accolade 24 hours after it emerged that he will ask to leave to club. But while some fans jeered, others shouted: "Stay, Raheem." The England international is expected to tell manager Brendan Rodgers and chief executive Ian Ayre on Friday that he wants to leave Anfield this summer. Speaking at the event, Rodgers said it had been a "difficult, trying season". Liverpool will finish outside the top four in the Premier League and therefore miss out on a place in next season's Champions League, while Rodgers is first Reds boss to fail to win a trophy in his first three seasons since the 1950s. He added: "A number of distractions that we couldn't have planned for have made it difficult, but the players have given everything." Brazilian midfielder Philippe Coutinho, 22, was voted Player of the Season. Sterling rejected a new £100,000-a-week contract in April but denied being a "money-grabber" in an exclusive interview with BBC Sport which was not authorised by his club. He said: "I talk about winning trophies throughout my career. That's all I talk about." The forward told Rodgers before Liverpool's 1-1 draw with Chelsea on 10 May that he wanted to leave, but it is understood the Reds want to keep the player, whose deal ends in 2017. Should Sterling be made available, Manchester City are the frontrunners for his signature, while a number of leading European clubs have also expressed an interest. Arsenal manager Arsene Wenger refused to be drawn on whether he would make a bid. 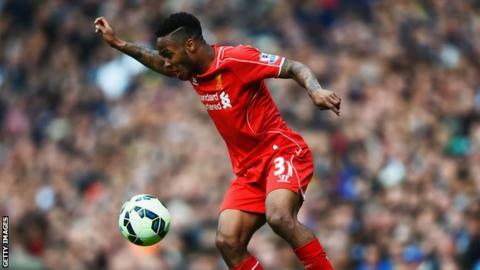 Several former Liverpool players have criticised Sterling and his representatives. Former Reds striker Emile Heskey said Sterling would be "denying himself the opportunity to grow and develop into a top player" if he left, and that Liverpool should "try as hard as they can" to persuade him to stay. John Aldridge, who played for Liverpool between 1987 and 1989, said Sterling had been given "woeful advice from his agent" and that "everyone in the game" felt it would be best for his development to stay. Former Liverpool winger John Barnes said Sterling should stay at Anfield, claiming he would not be guaranteed regular first-team football elsewhere as he has still "not achieved anything".